The Pet Store Puppy - AKC Doberman Pinschers for pet and select show homes. Since there is a growing number of people seeking puppies from other sources, I decided to post my thoughts and feelings on the subject. First of all, people are getting Dobies (as well as other breeds) from more pet stores and brokers without seeing parents, pedigrees and health clearances. These dogs are not normaly good representatives of the breed but are sold at quality prices. Most if not all the breeding stock has not been health checked or even been to a vet. The parents of the dogs live in kennels there life until they are done breeding, then they get rid of them. 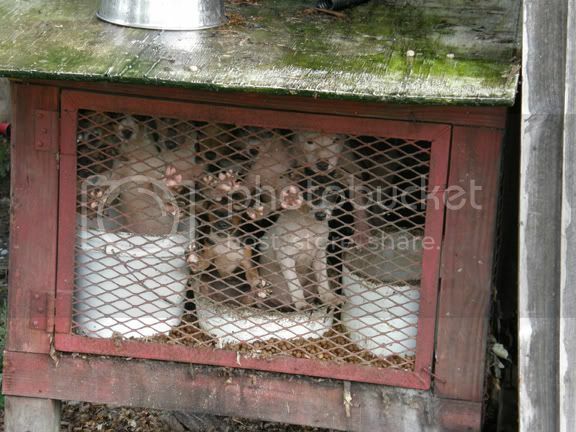 The ONLY way to stop pet stores from selling puppies is for people to STOP buying them! It may be sad and tug on your heart strings, but the only thing you are helping to do is keep that puppies parents in a life of misery. If they can't sell the puppies, they will have to quit offering them. Its that simple. I want to add, that puppies do not come from caring people who have a few litters a year; most if not all the dogs sold to pet stores are from puppy mills and dog auctions. Good and reputable dog breeders health test their breeding stock, always! These people take the health and care of the dogs first, they don't just throw any dogs together. It is our responsibility as keepers of the breed, to breed excellent examples and to spay/neuter the ones that arn't breeding quality. It would greatly cut these stores resources at getting dogs to breed carelessly if the pets were fixed. Not only are adults suffering, you are taking a BIG RISK taking the puppy home, 90% have health problems and later die from it. Not only that, if the puppy doesn't die likely it will have you spending thousands for health care issues. Spend your money on a dog that has been carefully bred. Search different breeders, see parents, see proof of vet care. Be a picky buyer otherwise you will be supporting this discusting sale of dogs that never get to step on grass or feel loved. Please click on the links to learn more. Click HERE, HERE, HERE, and HERE for more info. These days, the industries we quarrel with don’t even try to engage The Humane Society of the United States head-on regarding animal cruelty. They bob and weave and attempt to take the conversation in some other, irrelevant direction. And that, friends, leads to some strange assertions indeed. Last week, you’ll recall, we exposed Petland as the biggest national chain trafficking in dogs from puppy mills. Petland decided to post the rhetoric and falsehoods from the Center for Consumer Freedom, which I've written about before—a front group for a vast array of animal abusers, polluters, and junk food peddlers doing harm to society. It's too bad that a company that says it is reputable aligns itself with a group as ethically challenged as CCF. But try Petland's other argument on for size: Petland now claims its retailers help secure adoptions for homeless animals. It's only true if you consider a marked-down puppy a homeless dog ready for adoption at a cut-rate price. Most Americans know exactly what pet adoption is. And it’s the polar opposite of what happens at many Petland stores. The HSUS's investigation exposes Petland's deception. The HSUS's eight-month investigation showed that this nationwide chain of retail outlets sold puppies who were produced in overcrowded, awful breeding factories known as puppy mills. Our investigators showed Petland employees stating flatly that the puppies sold on premises were procured from breeders with the highest standards. Our video footage and the paper trail of puppy sales, though, told a different tale—of dogs produced in massive breeding operations in multiple states. Unable to defend the puppy mill cruelties that dooms breeding dogs to barren lives in cages without socialization or the kind of human affection that pets deserve, Petland rolled out the claim that it has an “Adopt-A-Pet” program. The PR team at Petland knows that “adoption” has as many positive connotations as “puppy mill” has awful ones, so why not bob and weave. But Petland using the word doesn’t make it true. In fact, we were sure they’d try to raise the subject to divert public attention. So before our investigation was made public, our experts called every one of the 133 Petland stores operating at that time in the U.S. We asked if the store participated in the “Adopt-A-Pet” program—and if so, where the adoptee dogs come from. To start out with, 56 of the stores said they didn’t bother with adoptions. Then we heard some strange answers: 23 stores said they offered cut-rate adoption prices on older puppies that had not sold, 16 said they offered puppies for adoption when the animals were returned by previous customers, and seven stores said they wanted to offer homeless dogs for adoption but they couldn’t get a supply of pups from local shelters. Little wonder about that last claim. Animal shelters know that retail puppy-sellers and the whole puppy mill industry are large contributors to the overpopulation of dogs in the U.S. Why support them? Now, to be fair, we found some Petland stores that claimed to offer puppies that were brought in by local people, sometimes from “accidental” litters. A few stores said they would occasionally refer customers to shelters. Some said they actually did offer shelter dogs for adoption—but I have to wonder. The Petland stores we investigated weren’t leveling with other customers about the source of their retail dogs. And from what we found when we scratched the surface of their "adoption" program, it appears they are again using feel-good language to mask the fact that Petland makes life worse for animals in so many ways. When a person or family makes the decision to bring a dog into their home, the last place they should go looking for an animal is at stores that profit from the puppy mill industry. Bringing a dog into your life is about love and companionship and hope. It shouldn’t have anything to do with cruelty.